Elbląg city is a separate county, not part of Elbląg county. At this website is a presentation of the EU-flag with some scribbling on it, and on the background is the vertical hanging flag of Elbląg city. Znamierowski, 'The World Encyclopedia of Flagś, 1999, shows several interesting flags of the Port Cities of northern Europe. These are derived from gonfanons, originally red in color. The flags, in a banner form, were flown from the stern of the vessels, the mast carrying the gonfanon of the colors. 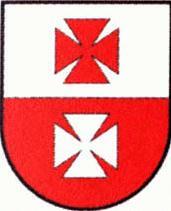 The flag of Elbląg (Elbing) dates from the 14th century.